I have a love hate relationship with cleaning and keeping my home tidy. Some days, I love it and I can clean for hours on end! Other times, I can go for weeks without even picking anything up or doing a single dish and the house is embarrassingly disgusting. But in the past year or two, I’ve learned a lot about what works for my household and what doesn’t, and only in the past month have I implemented a plan that works for Rene and me and keeps our home clean on the most part. Rene and I can be awesome partners in a lot of fields, in business and in life, but one thing I’ve come to learn about us is that I am just more naturally driven to clean up our home and home office than Rene does. That doesn’t mean Rene doesn’t like it clean, it just means that I end up doing more cleaning than he usually does, which I don’t really mind when I’m in the mood for cleaning. However, when I’m not in the mood for cleaning, this has caused a lot of issues for us, because I would start pointing fingers at him for not tidying up after himself even though I’m being just as lazy about not cleaning up myself. Yes, a very unaccomplished characteristic indeed! I also often wonder if it’s just in my female genetic code to be more drawn to cleaning than Rene. I know that I’m not the only naggy girlfriend out there who complains how messy her boyfriend is! I love it and I hate it! Oh cleaning, why do you treat me so? So after a few months of this in our first apartment together, Rene convinced me that we should hire a maid to help us clean up when we were too busy to do so ourselves. This was actually quite difficult for me to accept because my family (consisting of my mom and me) has never hired anyone to do cleaning for us, and it seemed too luxurious of a thing for Rene and I to suddenly hire a maid for our small one bedroom apartment at the time. But it turned out to be one of the best things we ever added to our lives! I absolutely loved it when we could afford to have a maid come in to clean up when things got too hairy or before/after we threw parties in our home. And it was quite affordable, too. In Los Angeles, you can easily hire a maid to clean your apartment for as low as $45 and it only takes the maids 1-3 hours to do it. Earth Friendly Maid Service: The best eco-friendly maid service in the Los Angeles area! Our cleaning experience got even better when I researched into finding a green/eco-friendly maid service that only cleaned with natural products. I found Earth Friendly Maid Service, which cost a little bit more than the average cheap maid service in Los Angeles, but boy is the extra cost so worth it! Now when the maids come to clean, the house smells like beautiful natural flowers afterwards, and we have the ease of mind that nothing toxic is being used in our home. On top of that, the owner of Earth Friendly Maid Service, Deborah Davis, is amazingly passionate about cleaning, and I wouldn’t want to hire anyone who wasn’t as passionate about what they do. Just check out their website, she’s thought of everything about cleaning and her site exudes that passion! When she or one of her employees comes to clean, I know they’re going to do an awesome job that would be way better than if I tried to clean myself. Over the years, we’ve refined our maid services to come clean for us from every other month down to every two weeks. And because we’ve outsourced most of our cleaning, Rene and I are able to make more money rather than waste time on cleaning all the time, which allows us to afford maid service more often! We just started implementing cleaning services every two weeks about a month and a half ago, and I absolutely love it! I even have them do my laundry, which means I never have to do laundry again if I don’t want to. As someone who has spent way too much of my life thinking about cleaning and actually cleaning my home and clothes, I feel like a huge weight has been lifted off my chest and I’m now free to pursue other endeavors without being bogged down with the pressures of cleaning. I’ve been thinking a lot about how accomplished having a maid service is. It’s almost like I’m failing as a “house wife” by not doing the cleaning myself, but if that’s not something I really enjoy doing all the time and not even something Rene wants me to do, then it’s probably a good accomplishment on my part for coming to terms with my level of cleaning in my household and hiring someone else to do it for us. What do you think? Do you hire someone else to do the cleaning for you? Do you do it all yourself? Do you think it’s too expensive or not worth hiring someone to do such an easy task as cleaning? What are you tips and tricks of keeping your home clean and tidy? 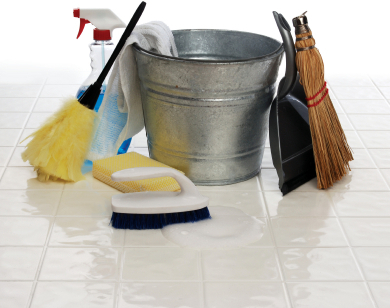 Having a maid regularly come in to clean is very convenient, that is, if you can afford it. True, having a maid is awesome if you can afford the service, but I think most people don’t really see how much they could be losing if they don’t take advantage of key services such as maids. I certainly would never have seen it if I hadn’t tried it for myself! As for the maid costume, I have yet to approach Rene with this topic, haha! I know this article is about a year old, but thank you for sharing that. I finally buckled down and decided to hire a cleaning service, after months of saying I was going to. They’re supposed to come and do a deep clean on our tiny one bedroom apartment next week. I was feeling guilty about not cleaning, stressed because our apartment is a filthy disaster, and guilty for even considering paying an expensive price for a cleaning service. Now that I’ve scheduled an appointment, I feel the same weight lift off of my shoulders. It will be worth every penny to come home to a clean house after working 10 hour days for 6 days a week. Cheers! That’s awesome LK! I’m glad that my post was able to help you feel better about hiring cleaning help. Totally worth every penny!